When I was a teacher the class every semester had so many broken crayons it was ridiculous and I thought about what a waste. I had a student who would break them because he hated using new crayons. When I was going through my student teaching a teacher used to upcycle the crayons by melting them down and putting them in muffin tins to cool off and some were so awesome because of the rainbow crayons you would get from them. The student liked coloring with them more than the regular crayons. So, when I saw this project I just had to share it. I always get clear ornaments; because, I have made many different projects with them like minion, Ninja turtles, and yarn ornaments with them. I just found out you can get them at the dollar store and the have different shaped ones. I usually wait until Wal-Mart marks them down to $.10 after Christmas. Sometimes I can get a whole box for $1.00 instead of buying one for that much. Gather all your materials. Spread the newspaper out onto the counter. Start by making sure all the wrappers are removed from the crayons. Cut your broken crayon pieces into small pieces, if not already small pieces. Place the desired colors of crayons into your ornament. Microwave for 30 seconds in a microwave safe bowl. Remove from microwave with oven mitts protecting hands. Roll the colors around in the ornament and place in microwave again. 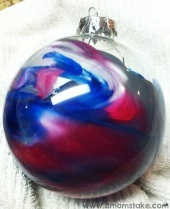 Repeat process until the colors are melted and swirled in the ornaments as pictured. Add embellishments as desired and you will have a great melted crayon ornament using all those old, broken crayons that were no longer useable. Tie up your ornament with a big bow for your tree and you’ll be able to show of your homemade ornament each year. This craft is easy enough that your kids can help you get the ornament started and mix it up as long as you are careful about the heat of the bulb and hot wax inside. I discovered when cleaned out my teaching stuff that I had 2 full paper bags full of crayons just from my own kids. Great gift the kids can do for grandparents and teachers for the upcoming holiday.